Comments: This is a rather unusual and rare item. We know the dies were cut by F.C. Key of Philadelphia and it has been discovered the tokens were mentioned in the March 25-26, 1862 sale catalog of the Philadelphia coin dealer Edward Cogan. A few examples were struck in silver (Baker 563 and Miller Pa 4), copper (Baker 563B and Miller Pa 7), white metal (Baker 563C and Miller Pa 6) and a unique piece in brass (Baker 563A and Miller Pa 5). It is generally thought the total production was limited to twenty examples. Rulau and Fuld in their revision of Baker estimate the silver variety as a rarity of R9 (2 to 4 examples exist) while they assign an R7 (10 to 19 examples) to the copper and white metal versions. It is conjectured Cogan commissioned the samples to be produced as prototypes in the hopes of obtaing a sizable order from the Philadelphia businessman Sylvester Magargee, one of the four partners in the Mount Holly Paper Company. Apparently Magargee rejected the idea so large scale production the tokens was never undertaken. According to Rulau and Fuld the Mount Holly Paper Company was founded in 1856 and is still in business in the original building as the Eaton Dikeman Company. The obverse of this token displays an bust left portrait of Washington in military dress. On the obverse legend the abbreviation PA was cut in the reverse direction of the remainder of the legend; this may have been intentional to make it more easily read by the viewer. 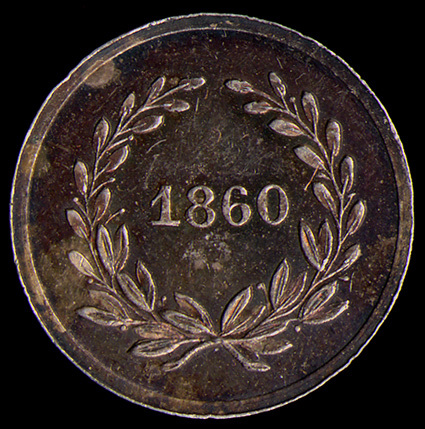 The reverse die displays the date 1860 in an olive branch wreath. This reverse die was also used for Cogan's storecard (Miller Pa 90 90F). Additionally, according to the May 29, 1865 catalog of the New York City tobacconist and token dealer Joseph N.T. Levick, a Washington token was produced surreptitiously by an unnamed diesinker who muled William Idler's small Washington head obverse (of Baker 545, Miller Pa 229 - 230) with Cogan's 1860 wreath reverse producing several mule varieties (Baker 208, Miller Pa 91 - 98A). These mules have an undraped bust right portrait on the obverse with the legend GEORGE WASHINGTON and a reverse with 1860 in an olive branch wreath. They are found in various metals, with both reeded and plain edge varieties. (Note: the George Washington bust storecards of the Philadelphia coin dealer William Idler were produced by the Philadelphia diesinker Robert Lovett, Jr.). Obverse: GEORGE WASHINGTON [on the far left edge of the neck truncation is LOVETT]. 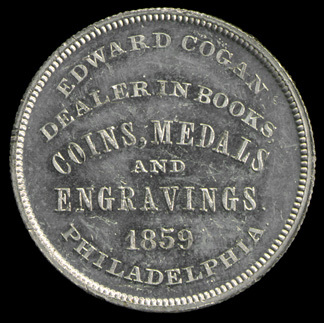 Reverse: EDWARD COGAN / DEALER IN BOOKS, / COINS, MEDALS / AND / ENGRAVINGS / 1859 / PHILADELPHIA. Comments: This 1859 dated storecard was produced in copper and white metal with an additonal eighteen examples in silver. 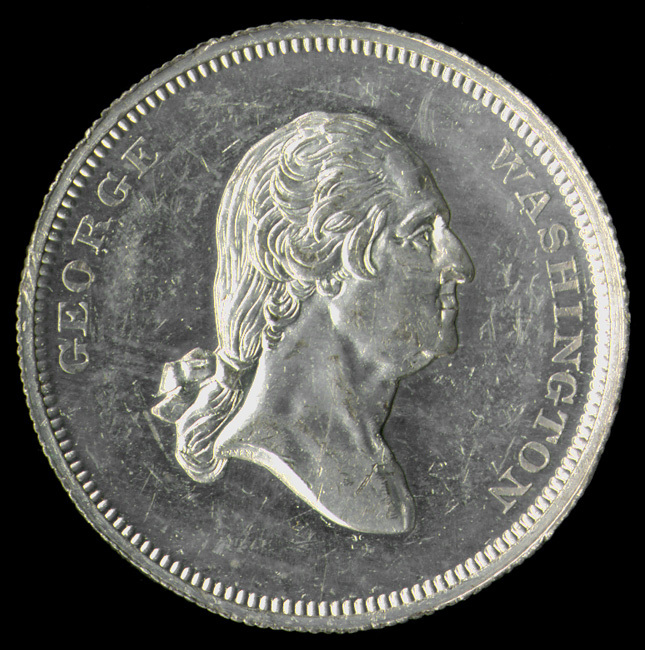 The obverse shows a draped bust right of Washington signed by the Philadelphia diemaker Robert Lovett, Jr. 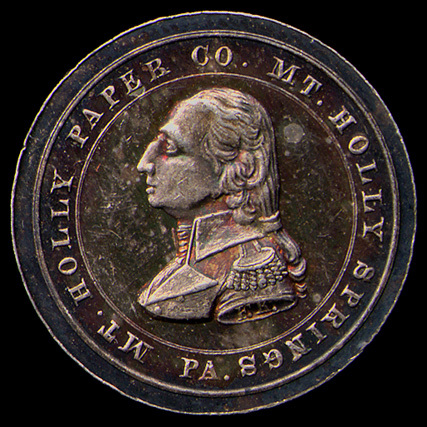 This obverse was also used on an undated Washington Birth/Death medal (Baker 136). 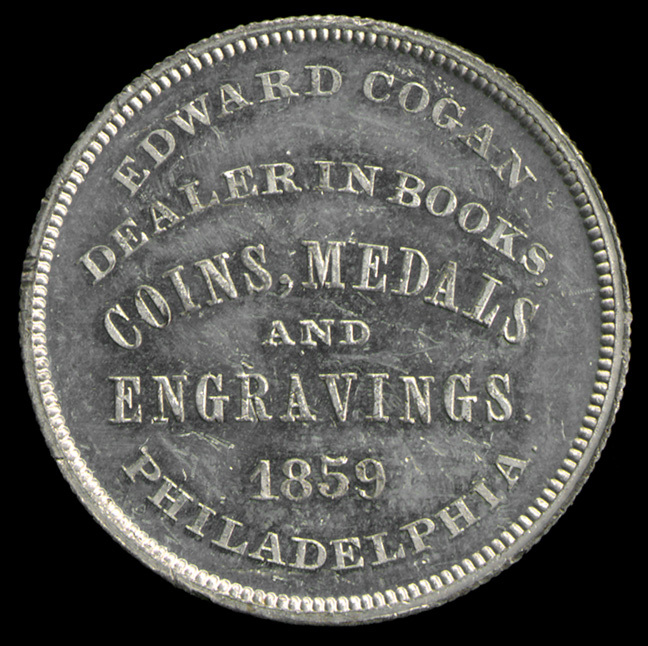 According to Cogan the obverse die was stolen on December 14, 1859. Cogan used a smaller but similar obverse made by Lovett for his 1860 storecard (Baker 527, Miller 91), this smaller obverse Washington bust was also used by the Philadelphia coin dealer William Idler (Baker 545). References: Rulau and Fuld, p. 269 and p. 111 on the die; Rulau, Standard Catalog of United States Tokens, 2nd ed., p. 279. 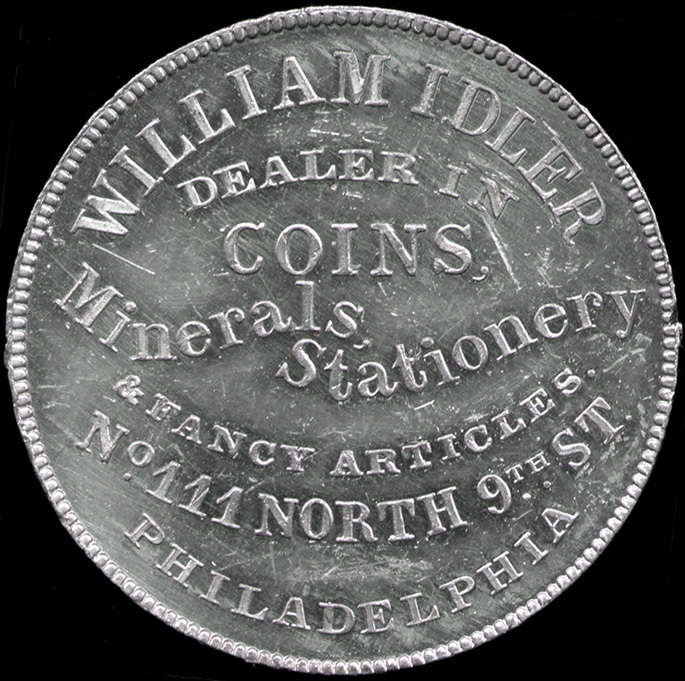 Comments: Struck in 1859 by Robert Lovett, Jr for the Philadelphia coin dealer William Idler. 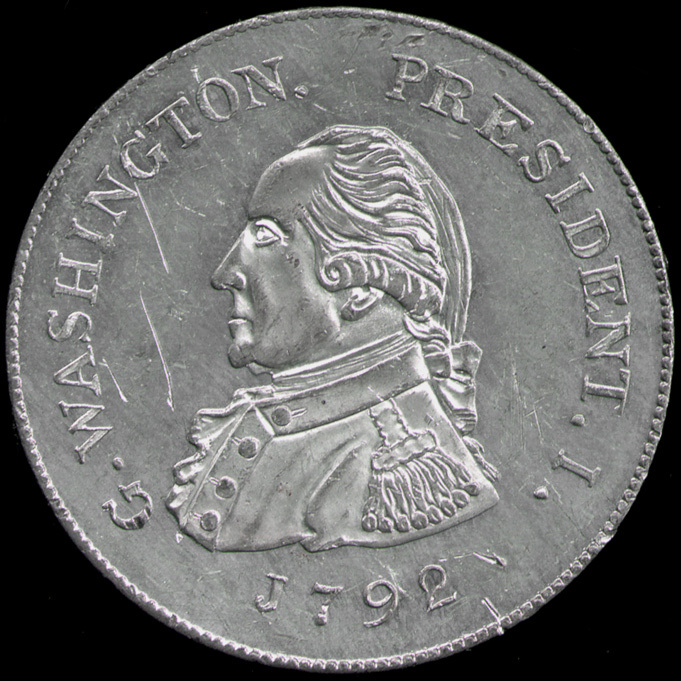 The obverse, with the uniformed bust left Washington portrait, imitates the 1792 pattern of Peter Getz (Baker 25). For additional information see the Getz entry in the colonial section. Idler produced imitations of the Getz coin and also muled the obverse (shown here) and the reverse (Pa 213-215 displaying an eagle with speard wings) with his storecard. 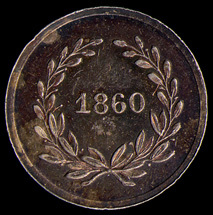 In Rulau and Fuld's revision of Baker from 1985 the storecard was dated as 1860, but in Rulau's 1994 2nd edition of his token catalog the silver versions are dated to 1859 but the copper, brass and white metal varieties are not dated.